I've been thinking about the matter of London and the kind of 'two-speed Britain' stories which have been in the press recently. The idea is that London's continued growth and prosperity - in contrast to the rest of the UK - is a problem. The BBC covered this via Stephanie Flanders in March and the Guardian did a piece on it in May this year. The Economist even did a special supplement on London last year, entitled 'On a High' in which they covered a range of issues, not just economic growth - e.g. 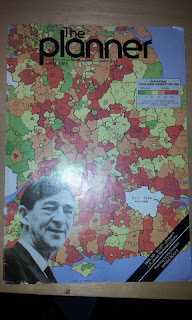 a map and some of my work on deprivation on p. 7 of the pdf. These kinds of stories always generate a lot of debate (see the comments on the Guardian piece for an example) of the 'London vs. the rest' variety but I suppose the thing that sticks in my mind is that none of this is really new. The precise nature of London's recent resurgence is perhaps unique but it's hardly a new problem. 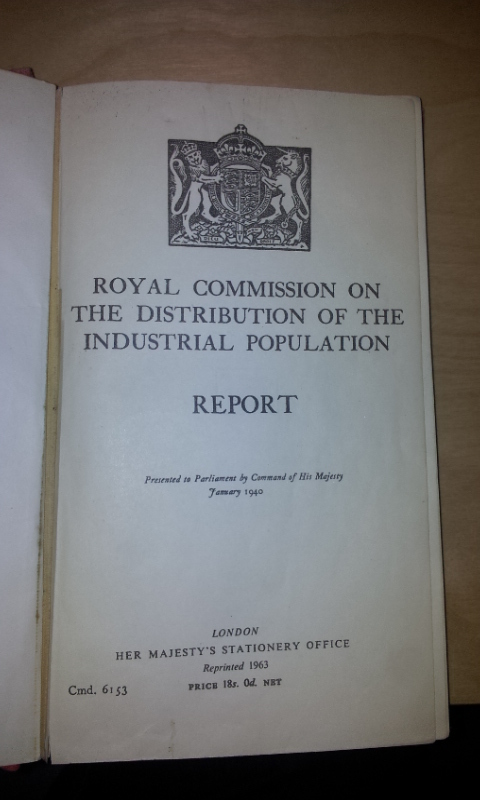 I was reminded of this last week at the Centre for Urban Policy Studies 30th Anniversary conference in Manchester when Sir Brian Briscoe quoted from the Barlow Report of 1940 (photo below - yes, I actually have a real copy to hand!). 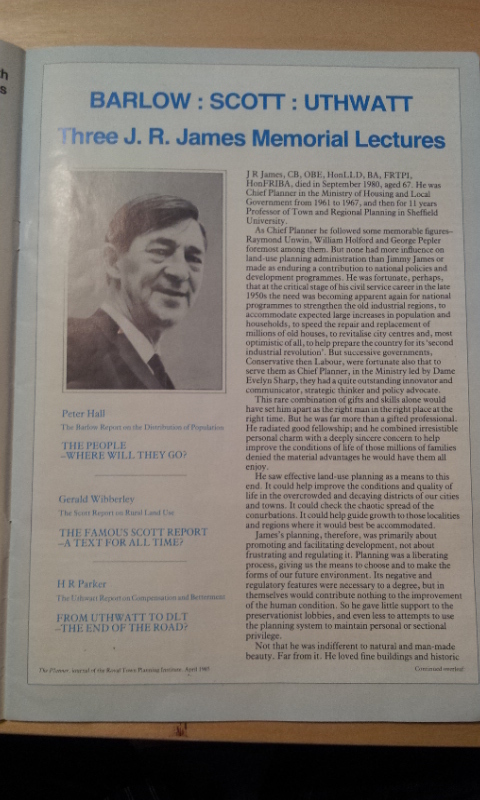 This in turn reminded me of the 1985 edition of the Planner magazine that I've had on my desk for some time. Why do I have this? 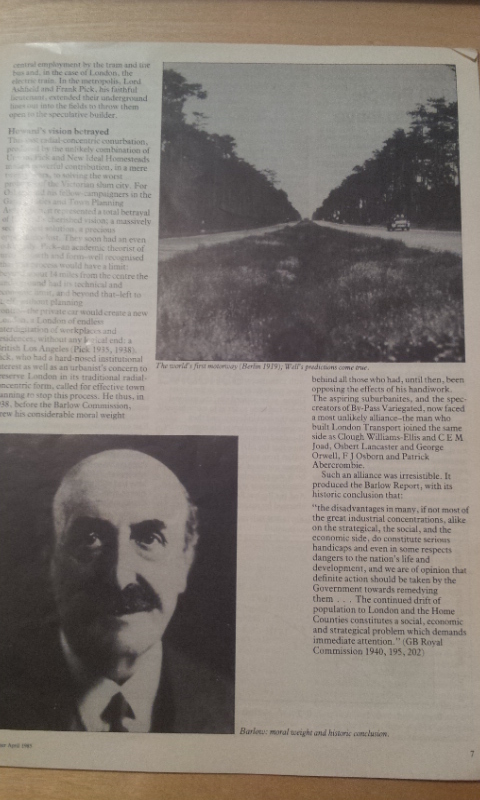 Because it's a special issue to commemorate the life of former Chief Planner and University of Sheffield Professor JR James, who featured on the front cover of the April 1985 edition, five years after his untimely death in September 1980. In this edition, leading planners of the time gave a series of lectures on seminal reports - Peter Hall on The Barlow Report, Gerald Wibberley on The Scott Report and HR Parker on The Uthwatt Report. 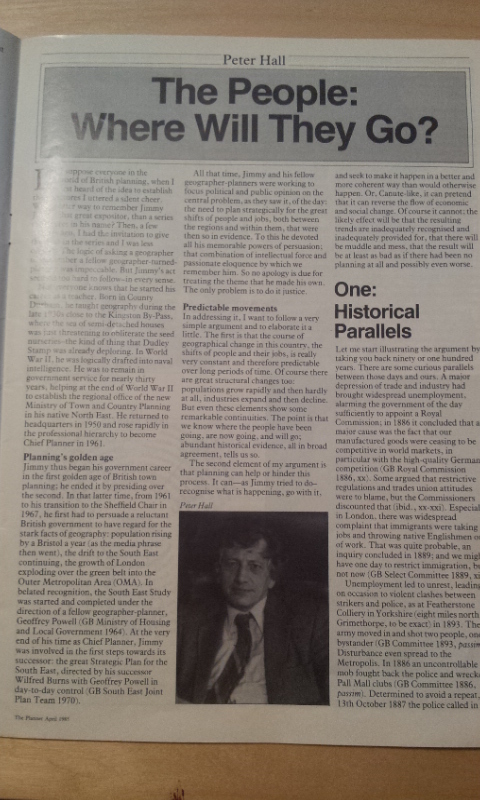 Peter Hall's reading of Barlow is fascinating for many reasons but I found it interesting that he chose to pick out the exact same quote that Sir Brian Briscoe did last week: "the continued drift of population to London and the Home Counties constitutes a social, economic and strategical problem which demands immediate attention" (p. 202 - see below for copy of the original, in paragraph 5). These words were written in very different times (e.g. it was published shortly after the outbreak of WW2 and in fact some of the content had to be changed to reflect this) but the over-arching message of a dominant London and a lagging rest of Britain resonates today. 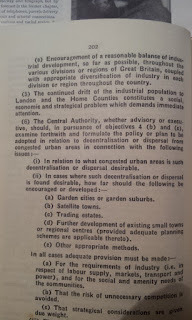 The policy solutions proposed in 1940, however, are rather different to those suggested today. For example, there was a strong emphasis on regionalism in the Barlow Report - unlike today. Further, there was a real concern about what could be done to address this nationally problematic uneven development (well, at least in theory) - e.g. Part IV from p. 185 is entitled 'Remedies ... And to Report what Remedial Measures, if any, should be taken in the National Interest'. So, this is not just an historical curiosity. On p. 197 we have more on 'methods of decentralisation or dispersal', which many today would like to see. 1. Lost in much of this two-speed UK talk is the fact that inequality and poverty in London are quite extreme. That's what I was getting at in my very small contribution to the Economist supplement last year and in another Guardian piece. This is something that Ben Hennig has been looking at in more detail in recent times - see here for more. 2. Much less has been said about why this London/rest issue might be a problem and - more importantly - what might be done about it. Certainly, I don't think we'll see a Barlow-style Royal Commission about this any time soon. 3. What about the contribution of the rest of the UK to London's growth - e.g. in sending graduates, commuters, funding for infrastructure, and public transport - to name just four factors. The question here might be to what extent is London's growth down to the fact that it has a Barlow-esque gravity? Easy to answer but harder to quantify. 4. Are we witnessing a 'London supernova'? Will this bright shining star gradually fade? Fancy rhetoric, but worth thinking about, given the cyclical nature of boom and bust. See p. 52-54 of this RTPI report for more. 5. 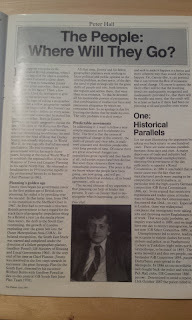 And, finally, we ought to look at old books and magazines more!